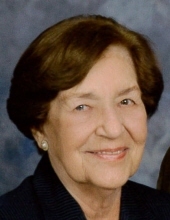 Barbara B. Campbell, 93, passed away on Nov. 10, 2018. She was born in Brooklyn, NY to the late Dana and Elizabeth (Farnan) Bloch and lived most of her adult life in New York. Barbara was a New Yorker through and through - you only had to visit with her for a few minutes to know it. Her legacy shines through her family - memories of the wonderful times we shared. She was most happy when she knew all the kids, grandkids and great-grandkids were happy and healthy. She took great pleasure in getting to know people and reaching out in any way she could. She taught us all to enjoy life and to laugh while we have it. She was attentive to her church and spiritual life and was universally beloved by all that knew her. She embraced life and lived it to the fullest. In addition to her parents, Barbara is preceded in death by her husband of 74 years, John Campbell; and son, Gregory John Campbell. She is survived by sons, Bruce (Debbie) and Wayne (Lorraine) Campbell; daughter, Patti (Jack) Nitzsche; grandchildren, Melanie Ludwig, Craig (Danielle) Campbell, Lauren (Greg) Clark, Corinne Campbell, Allison Campbell, Brian Nitzsche, Megan Nitzsche; great-grandchildren Olivia Ludwig, Brandon and Ava Campbell and Brooks and Oakley Clark; and many other loving family and friends. Visitation and service will be Saturday, December 1, at First United Methodist Church, 245 Portage Trail, Cuyahoga Falls, OH 44221. Visitation will be from 10:00 am to 11:00 am with the funeral service following at 11:00 am. Barbara's final resting place will be at Chestnut Hill Memorial Park. In lieu of flowers, memorials may be made to The Alzheimer's Association P.O. Box 96011 Washington, D.C. 20090-6011 or The First United Methodist Church Gift and Memorial Fund,245 Portage Trail, Cuyahoga Falls OH 44221. You are invited to hbm-fh.com to view Barbara's tribute wall, offer condolences and share memories.